Major event, organised by The Costas Grammenos Centre for Shipping, Trade and Finance, considers Is this World changing? 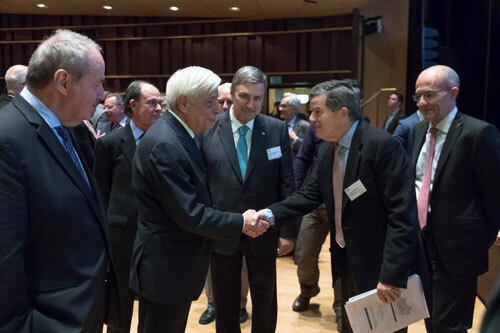 His Excellency the President of the Hellenic Republic, Mr Prokopios Pavlopoulos, addressed global business leaders, diplomats, policy-makers and senior academics last week at the 4th Athens Triennial Meeting, held at the Onassis Foundation and organised by the Costas Grammenos Centre for Shipping, Trade and Finance at Cass Business School, City, University of London. The Triennial Meeting welcomed more than 1,100 delegates over two days and considered the question Is this World Changing? Subjects discussed included the World Economy; Investments; Banking and Finance; Energy; Dry Market; Tanker Market; Shipping Finance; and Industry and Tourism and Capital Markets in Greece. 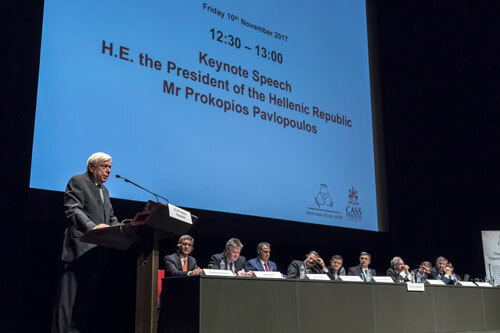 Professor Costas Th Grammenos CBE DSc, Centre Chairman and Triennial Founder, opened proceedings by welcoming delegates, thanking sponsors and honouring the President of the Hellenic Republic. Professor Grammenos said the Triennial Meeting focused on the current geopolitical, financial, environmental and humanitarian challenges facing the world and considered their impact on shipping, banking and finance. Professor Grammenos said he was delighted to welcome delegates and particularly honoured that the President was able to deliver the keynote address. “We are honoured that President Pavlopoulos is able to join us today. These important Meetings are a platform for business leaders, policy-makers and academics to discuss and debate issues of challenge, competition and innovation and their consequences within a global context. “I am especially pleased to see so many of our valued alumni here, many of them speaking on our panels. Indeed, the Centre has a network of 3,500 alumni from over 160 countries and we are very proud of them and their achievements. The President of the Hellenic Republic spoke on the subject of A Strong United Europe: European Cohesion and Unification. His speech covered the history of the EU, the importance of the European vision and ideal, the importance of the Rule of European Law and of strong European economic and foreign policy. "You are not in debt to me Professor Grammenos. On the contrary, I am in debt to you because you give me this opportunity to speak to such an excellent audience. The President described the meeting as a "milestone meeting", adding "due to the level of the people here, but also the question: How and in what direction the world has to change". “Those of us who are part of the European Union and have a truly European consciousness, which drives our common struggle for completing the European project, ought to understand that its role extends well beyond its peoples and across different periods. It is literally global. Fulfilling its mission is of an existential importance to mankind as a whole,” he said. Delegates also heard opening remarks from Professor Sir Paul Curran, President, City, University of London and Professor Marianne Lewis, Dean, Cass Business School. Sir Paul sought to reassure delegates that City and the rest of London are very much open for business, following the 2016 Brexit vote. “One of the topics that will loom large during this meeting is Brexit. As you know and this meeting demonstrates, the worlds of shipping, trade, finance and academia know of no barriers and thrive on friendly interaction between all people, of all nations. This is something that will not change. 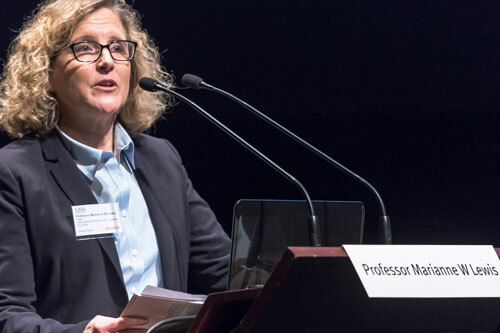 Professor Marianne Lewis, Dean, Cass Business School paid warm tribute to Professor Grammenos, describing him as a “colleague and friend” and thanking him for his exemplary leadership of the Centre. “At Cass we have been at the leading edge of extraordinary business education for 50 years, aspiring to excellence and constantly seeking new ways to serve our students and alumni and shape business practice and policy. We enable the extraordinary – leadership through knowledge creation, education and community partnerships. The Centre for Shipping Trade and Finance at Cass Business School was established by Professor Costas Th Grammenos CBE DSc in 1983. In April 2007, the Centre was renamed in honour of its founder. The Centre pioneers postgraduate study and offers the first specialist MSc degrees in Shipping, Trade and Finance; and Energy, Trade and Finance. Through its unique blend of theory and practice, the Centre has gained international recognition among industry leaders, policy-makers, government and academics. The Athens Triennial meeting was established in 2004 with the objective of bringing together world class business leaders, policy-makers and academics to discuss and debate international issues of wider importance to the business, shipping, trade and finance community. On day one, the first session examined the World Economy I with Mr Huw Pill, Chief European Economist, Goldman Sachs International and The Hon Apurv Bagri, President and Chief Executive Officer, Metdist Group. This was followed by the World Economy II with Dr Anthony Papadimitriou (Chair), President, Onassis Foundation; Mr Thanassis Martinos (Co-Chair), Managing Director, Eastern Mediterranean Maritime Ltd; Mr Cyrus Ardalan, Chairman, Citigroup Global Markets Ltd., Independent Portfolio Management S.A.; Mr Efthimios N Christodoulou, Former Governor, Central Bank of Greece; Professor Martin Stopford, Non-Executive President Clarkson Research; Honorary Visiting Professor, Costas Grammenos Centre for Shipping, Trade and Finance, Cass Business School, City, University of London; Mr Mohsen Ziya, Founder and Managing Director, Neptune Energy Trading LLC, Honorary Visiting Professor, Costas Grammenos Centre for Shipping, Trade and Finance; Professor Eddy Van de Voorde (Discussant), Professor of Port and Maritime Economics, University of Antwerp (C-Mat and TPR), Honorary Visiting Professor, Costas Grammenos Centre for Shipping, Trade and Finance, Cass Business School, City, University of London and Mr Harry N Vafias (Discussant), Founder and Chief Executive Officer, Stealthgas Inc. Session three on Investments was led by Sir Graham Day (Chair), Counsel, Stewart McKelvey. Mr Nanakjeet Singh Bajwa (STF 1999), Head of Private Equity and Infrastructure, Emirates Investment Authority (EIA); Mr Knut Mathiassen (STF 1988), Managing Partner, Northcape DMCC; Mr Sanjay K Mehta (STF 1993), Founder, Chairman, S ONE Capital and Mr Nazeem Noordali (STF 1988), Chief Operating Officer, International Islamic Trade Finance Corporation (ITFC), Member of the IDB Group. Session four on Banking and Finance was led by Mr Michael Parker (Chair), Managing Director; Global Industry Head for the Shipping, Logistics and Offshore Citigroup Inc. with Mr Kristian Andersson (STF 1992), Chief Executive Officer, SEB Ukraine; Mr Cyrus Ardalan, Chairman, Citigroup Global Markets Ltd, Independent Portfolio Management S.A.; Professor Daniel Giamouridis (PhD 1998), Global Head of Scientific Implementation, Bank of America Merrill Lynch; Associate Professor , Athens University of Economics and Business; Mr Nicholas Hadjiyiannis (STF 1994), Chief Executive Officer, Cyprus Cooperative Bank; Mr George Lassados, Director, Lassados Capital AG and Mr Nazeem Noordali (STF 1988), Chief Operating Officer, International Islamic Trade Finance Corporation (ITFC), Member of the IDB Group. Session five on Energy was led by Dr Basil Papachristidis (Chair), Chairman, Hellespont Marine Services Ltd with Dr Kostas Andriosopoulos (PhD 2006), Professor, ESCP Europe Business School; Dr Panos Pouliasis (ETF 2004), Senior Lecturer in Energy / Commodities and Finance; Co-Director, MSc in Energy, Trade & Finance, Cass Business School, City, University of London; Mr Bron Sharman (STF 1991), Portfolio Manager, Petroleum and Tanker Freight, RCMA Capital LLP; Professor Michael Tamvakis (STF 1988), Professor of Commodity Economics and Finance; Co-Director, MSc in Energy, Trade and Finance, Cass Business School, City, University of London; Mr Mohsen Ziya Founder and Managing Director, Neptune Energy Trading LLC, Honorary Visiting Professor, Costas Grammenos Centre for Shipping, Trade and Finance. On day two the Dry Market was discussed by Dr Sadan Kaptanoglu (Chair) (STF 1996), Chief Executive Officer, Kaptanoglu Shipping;Chairperson, Turkish Marine Environment Protection Association (TURMEPA) with Professor Martin Stopford (Co-Chair), Non-Executive President, Clarkson Research, Honorary Visiting Professor, Costas Grammenos Centre for Shipping, Trade and Finance, Cass Business School, City, University of London; Mr Nicolaus Bunnemann (STF 2005), Managing Director, Atlantic Lloyd GmbH & Co. KG; Mr Asaf Malamud (STF 2013), Deputy Chief Executive Officer, Portline Holdings Maritime Corporation; Mr Nikolas Triantafyllakis (STF 1986), Director, W Marine Inc.; Mr Stamatis Tsantanis (STF 1997), Chairman and Chief Executive Officer, Seanergy Maritime Holdings Corp. and Mr Eleftherios Veniamis (STF 2000), Director, Golden Union Shipping. The second session on the Tanker Market was led by Mr George Procopiou (Chair), Chairman of the Board of Directors, Dynagas Ltd.; with Mr Laurent Bozzoni (STF 1998), Managing Director, Socatra Group; Mr Michael Fostiropoulos (STF 2000), Director, ALMI Tankers S.A.; Mr Modi Mano (STF 2002), Managing Director / Founder, M Sea Capital Ltd.; Professor Nikos Nomikos (STF 1993), Professor of Shipping Risk Management; Director, MSc in Shipping Trade and Finance, Cass Business School, City, University of London; Mr Nicolaus Oldendorff (STF 2008), Managing Director, Reederei Nord GmbH, Professor Martin Stopford, Non-Executive President, Clarkson Research, Honorary Visiting Professor, Costas Grammenos Centre for Shipping, Trade and Finance, Cass Business School, City, University of London. Session three on Shipping Finance I - Banks and Export Credit Agencies was led by Mr Ralf Bedranowsky (Chair), CEO and Chairman of the Board of Managing Directors, DVB Bank SE; Mr Ioannis Alexopoulos (STF 1996), Managing Director, Eurofin S.A.; Mr Niklas Bedranowsky (STF 2012), Vice President / Head of Greece, Berenberg; Mr Peder Garmefelt (STF 2000); Head of Shipping, FinanceSEB London; Mrs Christina Margelou (STF 1989), Head of Shipping, Eurobank Ergasias S.A.; Mr Nicholas Pavlidis (STF 1992), Head of Shipping Finance, Bank of Cyprus; Mr Dimitrios Sofianopoulos (STF 1989), Partner / Head of Greece and Head of Monaco, Norton Rose Fulbright; Mr Christoph Toepfer (STF 1997), Chief Executive Officer, Borealis Maritime Ltd.; Dr Sadan Kaptanoglu (Discussant) (STF 1996),Chief Executive Officer, Kaptanoglu Shipping; Chairperson, Turkish Marine Environment Protection Association (TURMEPA). Session four on Shipping Finance II: Capital Markets and Private Equity was chaired by DrNikolas P Tsakos (Chair) (STF 1985), Chief Executive Officer, Tsakos Energy Navigation Ltd. (TEN); Chairman, Intertanko; Professor Costas Th Grammenos CBE DSc (Co-Chair), Chairman, Costas Grammenos Centre for Shipping, Trade and Finance, Cass Business School, City, University of London with Mr Axel M Aas (STF 1992), Managing Director / Founding Partner, Clarksons Platou Project Finance AS; Mr Nanakjeet Singh Bajwa (STF 1999), Head of Private Equity and Infrastructure, Emirates Investment Authority (EIA); Mr Nicolas Bornozis, President, Capital Link Inc.; Mr John Dragnis (STF 1999), Chief Executive Officer, Goldenport Group; Mr Erik Helberg (STF 2000), Chief Executive Officer, Clarksons Platou Securities; Mr Sanjay K Mehta (STF 1993), Founder, Chairman, S ONE Capital; Dr Nikos Papapostolou (STF 2000), Senior Lecturer in Shipping Finance, Cass Business School, City, University of London and Mr Stamatis Tsantanis (STF 1997), Chairman and Chief Executive Officer, Seanergy Maritime Holdings Corp. Session Five on Industry, Tourism and Capital Markets in Greece was chaired by Mr Efthimios N Christodoulou (Chair), Former Governor, Central Bank of Greece; Mr Nikolas Bakatselos (STF 1995), President and CEO, Pyramis Metallourgia A.E. ; Mr Evangelos Charatsis (STF 1985), Chief Executive Officer, Beta Securities; Mr Manolis Giannoulis (STF 1987), Managing Director, Giannoulis Hotels and Resorts; Mr Aris Kefalogiannis (STF 1987), Chief Executive Officer, GAEA Products S.A.; Mr Thrasyvoulos Th Makios (LTF 2004), Deputy Chief Executive Officer, Makios Logistics; Mr George Politis (STF 1996), Chief Executive Officer, Capital Securities S.A. and Mr Michael Stassinopoulos (MSc STF 1989), Member of the Board of Directors, Viohalco S.A.